Global parking reservations provider ParkCloud has scooped an exclusive contract with budget airline leader Ryanair to run its entire parking portal, using their newly created channel management solution. The company is now extending its revenue development services to all its airline partners. Managing director Mark Pegler said: "Parking is a rapidly growing source of revenue for airlines, and one highly sought after by passengers." "Alongside the increasing demand for a more complete travel experience, passengers continue to look for simpler and cheaper ways to organise their travels, with many booking travel arrangements themselves." He added: "Ancillary services such as advance reservations are the extra mile customers want, which is why ParkCloud is delighted to offer a full sales channel management solution to airlines." 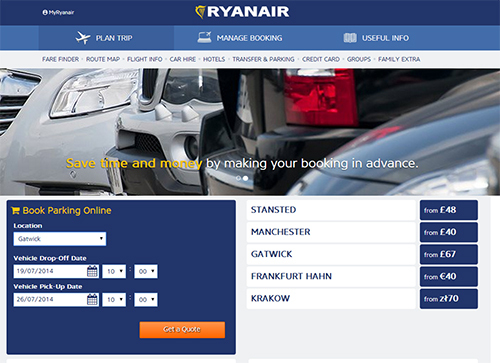 ParkCloud first partnered with low cost pioneer Ryanair in March 2013, offering parking reservations through a dedicated white label site and also directly integrated into the Ryanair flight booking process at Ryanair.com. Henceforth ParkCloud will manage all of Ryanair’s parking partners under a single website which is fully integrated with the airline’s new branding and style. The website is also fully responsive to a customer's device whether they are using a laptop, tablet or smart phone and they will enjoy ParkCloud's simple, three-step reservation system meaning a single, clear booking process. Now there is a single point of distribution for all bookings taken through the portal, liaising with all Ryanair's parking providers, which include, to name a few, Peel Airports Group, Dublin Airports Authority, Aeroporti di Roma and UniPark. Overall coverage of Ryanair's parking services extends over 60 locations, all now available to customers on a single platform. Mr Pegler said: "ParkCloud is very pleased to be able to provide a full channel management solution for Ryanair, which is a positive development for both parties after almost 18 months of successful collaboration." "The new white-label site will provide customers with a single point of contact for parking reservations when flying with Ryanair, where they can compare a wide range of parking options across Ryanair’s network." "Choice and comparison are key features in the service, ones that we feel help customers find a service that's ideal for them, creating a positive customer experience through Ryanair right from the passenger's arrival at their departure airport."